I have been wracking my brain for a few weeks now trying to think of a gift idea for my Dad for Father's Day. Unfortunately we live in another state to 'Poppy' so it had to be something that could be sent easily by mail. I also wanted it to be something personal from the girls, as well as something he could use. Obviously he will love anything our girls make for him, but I wanted something he could use day to day rather than something that would end up in a drawer or cupboard. Instead of putting our interview on paper though I thought I would put it on something that could be kept around the house and used. A cushion was the perfect solution! We started with a cushion cover which was blank on one side. I chose this one (from BigW) because the colours will suit Poppy's home and I love the symbolism of the saying on the front. I removed the cushion insert and inserted some scrap cardboard so the ink from the Sharpie wouldn't stain through to the other side. Then I just used a laundry marker to write out our questions and add in the girls answers. Their replies were hilarious and I know Poppy will love reading them. My favourite replies would have to be "He loves to wear: a moustache!" and "The best thing about Poppy is : he laughs and delivers packages to us". This activity was fun and easy to make and hopefully will be something Poppy can display in his house and smile at on a daily basis! Such a sweet gift idea. I love it. Pinning it now. This is fantastic Caz!! 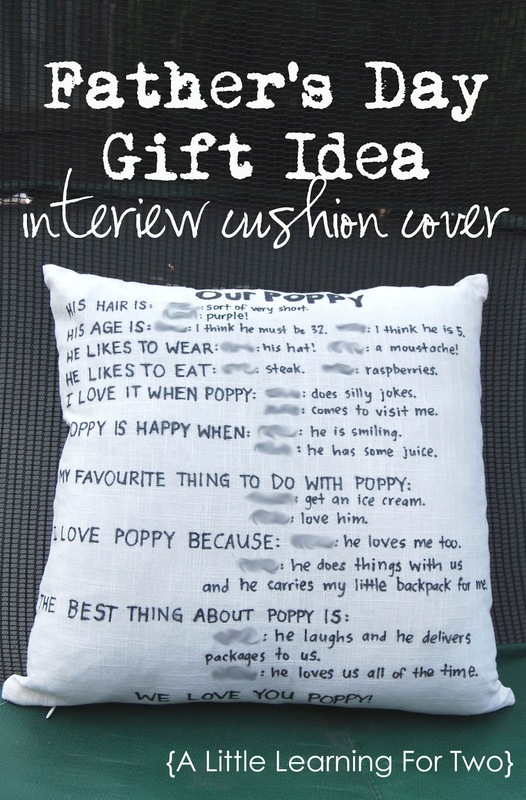 My hubby's 40th is next month and this will be the ideal gift from R. How absolutely perfect is that cushion from Big W? That's such a great idea. He's going to love it! What a beautiful keepsake, I love it. What an absolutely lovely way to create a keepsake....such a clever Mummy you are! 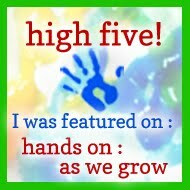 I have featured your wonderful idea on The Crafty Crow as a gift kids can make for Mother's Day!